¡Pa’ Mi Comunidad Latina: Yo Voy a Votar! One of our key strategies is to raise awareness and mobilize community members to have an electoral impact. An early example is the creation in the mid-1990’s of the Youth Uprising Coalition to defeat a proposed youth curfew on the ballot. Throughout the 2000’s, our electoral work was strengthened by our participation in capacity building programs by Mobilize the Immigrant Vote and the California Alliance (now California Calls). 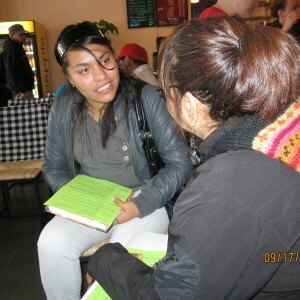 Since 2010, PODER has worked with San Francisco Rising, a coalition of eight grassroots organizations, to build the political power of poor and working class people of color in San Francisco. In just a few years, San Francisco Rising has had an impact on the City’s elections and the progressive landscape in San Francisco. This has included educating and mobilizing voters in 2010 to approve a local measure that would bring up to $36 million per year to save San Francisco’s vital services, by taxing the sale of luxury homes, to organizing to pass, in 2014, an increase of the minimum wage to $15 per hour by 2018. San Francisco Rising also conducts strategic campaigns—developing and implementing government policies via legislative changes and administrative efforts to improve the lives of poor and working class people of color communities in the City. Strengthen our organizational capacity to effectively implement an electoral program. Build organizational political power in targeted electoral districts in San Francisco through community organizing and voter engagement strategies, such as community education, issue analysis, and voter contact. Increase and sustain the participation of Latino immigrants in the electoral arena. Contribute to the creation of an effective statewide progressive voter network. Want to help mobilize the Latino community for the next elections? Contact us.